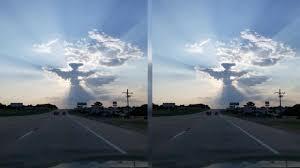 A Texas driver says he was in the right place at just the right time on Monday when he spotted a cloud that he says looked just like an angel floating over the horizon. The father of seven says he grabbed his phone and took a “spectacular” photo. He shared the picture on Facebook and the shot quickly garnered more than 1,000 shares on the social media site. This was the sunset as we were driving down Hwy 105. How awesome is that! The newlywed says he and Carmen have been dealing with difficult situations in recent weeks, so seeing the cloud proved to be a sweet moment for the couple. “We have literally been dealing with several different family matters since we stepped off the plane from our honeymoon,” he tells PEOPLE. “God can speak to us in many different ways and for that I’m thankful.